If you’ve ever picked up a piece of rigid foam sheet with your bare hands in winter, you know what a great insulation material it is. In fact, foam is so effective at preventing energy transfer that it even feels like the stuff is heated when you hold it without mitts on a cold day. Experiences like this, and some surprising scientific data I’ve discovered, convinced me to make foam the main part of my latest building project, a two-story, 24-foot x 28-foot woodworking shop with an office loft above. The building technology I used for walls and roof is generically known as structural insulated panels (SIPs), and it greatly improves the quality, durability and energy performance of Canadian homes. Here’s a quick look at what SIPs are and how to build with them. SIPs are a factory-laminated sandwich of foam and oriented strand board (OSB) that replaces traditional wall and roof framing in residential and light commercial projects. Five or six inches of foam between two layers of 7/16-inch OSB sounds pretty flimsy, but glue them together into a panel and three surprising things happen. First, they get very strong. Engineering studies show that a SIPs wall is three times as strong as an equivalent stick-framed assembly, but it wasn’t until I tried some experiments for myself that I became completely convinced. You can take a 10-foot long length of SIPs measuring just 6 1/2-inches x 8 inches in cross section, set it across blocks at each end and walk across the thing like a bridge. Even a 200 lbs. carpenter with a fully-loaded tool belt barely makes the thing flex. SIPs are very rigid. The second SIPs advantage is performance. Wall and roof structures made from these panels have better energy performance than stick frames because the foam insulation layer is continuous. SIPs are also impervious to internal condensation (no need for a vapour barrier), yielding a virtually mold-proof structure. As good as all this sounds, perhaps the best thing about SIPs construction appeals to us builders. It goes up fast while demanding much less skill than stud-frame work. Wall panels generally come in 4-foot wide sections, 8, 9 or 10-feet tall. Tilt them upright so they straddle the bottom plate, plumb them, then nail the OSB flange to the bottom plate and any adjoining walls. That’s it. Structural support, insulation and vapour barrier all go up at the same time. You can learn more about panel availability from the nonprofit Structural Insulated Panel Association (253-858-7472). SIPs are made in a handful of plants around Canada and shipped out via transport truck. You’ll typically find them in 4 1/2, 6 1/2 and 8 1/4-inch thicknesses, ranging from 8 to 16 feet in length, strapped together in plastic-wrapped bundles about four feet high. The foam along panel edges is factory-recessed back from the OSB skins so SIPs panels can interlock with bottom plates, top plates, and neighbouring panels. Although SIPs are used for both walls and roof structures, wall applications are the simplest and most appealing for first-time SIPs builders. Wall construction is a three-part process that’s different from stick framing, yet easy to master: lay down a couple of beads of expanding polyurethane foam on the wall plates attached to the floor deck; hoist a panel upright so it straddles the plate; plumb the panel and nail it through the OSB into the edge of the plate. A single plate attached to a wooden deck is ideal. Structures built on a concrete slab work best with two plates: one as wide as the overall SIPs thickness, and the upper one narrow enough to fit between the inner and outer OSB faces. If you’re building a corner, no temporary bracing is required. Long walls should be braced every 10 or 15 feet if a wind whips up before interior walls and double-top plates are added. Once SIPs walls are up, they’re not going anywhere. Unlike with stick-framed walls, there’s not much you can do to plumb-and-line a SIPs wall after it’s up. That’s why you have to make sure each panel is plumb before nailing it in place. It’s not difficult, you just need to know that it’s part of the deal. 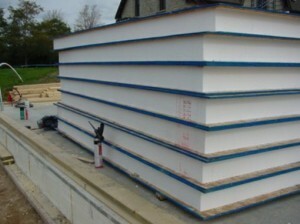 You won’t get far with SIPs construction before you need to cut panels. It’s not a prefabricated system, and still demands on-site measuring, cutting and fitting. And with typical wall panels at 4 1/2 and 6 1/2-inches thick, you’ll need something more than a skillsaw to do the work efficiently. The industry standard for cutting SIPs panels is something called a Prazi beam cutter (508-747-1490) It’s a chainsaw-type attachment that fastens to the blade arbour of just about any worm-drive or sidewinder circular saw. The Prazi does a surprisingly smooth and accurate job in cuts up to 12 inches deep, both through wood and SIPs panels. The only trick is that you need to fasten a straight piece of lumber to your panels to act as a saw guide. 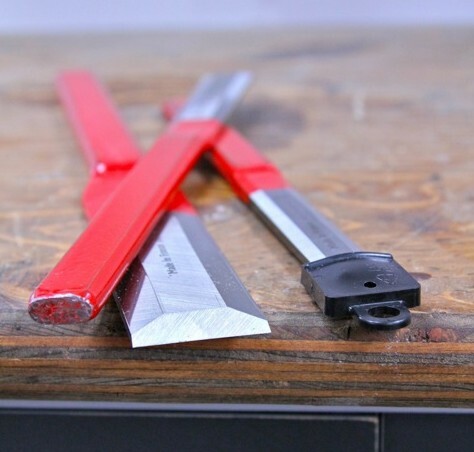 Without this you’ll get crooked cuts for two reasons. Besides the fact that you can’t see the pencil line during a cut (too much foam and OSB dust flying around), the chainsaw bar doesn’t track as straight as a circular saw blade does. Take the extra time to screw a nice 2×6 to your panels and cuts will turn out A-1. So you’ve cut your panel to the right size, but now there’s a new problem. That nice factory-recessed foam edge is gone. And without it there’s no way to connect the panel to a bottom plate, top plate or its neighbour. Recessing foam from cut panel edges is the job of something called a hot knife. It’s like a kind of soldering iron, except the heated wire is shaped to fit between the OSB sheathing on SIPs panels as it melts away a line of foam. Pull the hot knife trigger, let the wire warm for a few seconds, then drag the tool across the panel edge. The outer edges of the hot knife base ride on the OSB while the wire melts out a line of foam. Lift out the waste and you’ve got a newly recessed edge. SIPs panels can span window and door openings without added support from wooden lintels or headers up to a limit. Check manufacturer’s specs for details, but don’t be surprised if you don’t need to add much extra wood up above. Assembled panels can also carry surprisingly high point loads — nearing 5,000 lbs. per foot on 6 1/2-inch walls. Where point loads exceed this figure, internal columns of solid wood can be installed, typically made from double or triple thicknesses of 2×6 lumber. You can put these up during initial wall construction or afterwards. There are two ways to construct window and door openings in a SIPs structure, and the option that makes the most sense depends on the size of openings involved. Although you can erect walls with no openings, then cut small ones out afterwards, it’s neater and more efficient to create large openings as you go. Install full-height wall panels on each side of a door or window opening, put solid wood frame members along the sides, then drop in cut sections of SIPs panels to form the top and bottom of the openings. Fill the recessed edges with solid lumber, and you’re done. SIPs construction hasn’t yet become mainstream because people are cautious about new ways of building. That said, the system has a lot going for it. It’s gaining momentum and is poised to win a large portion of residential and light commercial projects. You can take a closer look at how it all works in a book — Building With Structural Insulated Panels by Michael Morley. It’s currently the best builder-friendly text on the SIPs subject. According to a field study conducted by Dr. Tony Shaw of Brock University between February 2000 and January 2001, SIPs homes beat stick-built construction hands down in energy performance. Two identical, adjacent homes were monitored during the study period, with three energy measurement methods used: air leakage testing, hourly internal wall temperature readings and infrared thermographic imaging to show overall heat loss from the outside of both buildings. Both homes were constructed by the same builder at the same time, and both were nearly identical in floor plan. The only difference was that one had walls framed with conventional 2×6 studs and fiberglass insulation, while the other had walls made with 4 1/2-inch thick SIPs. According to the Brock study, the stud frame home consumed nearly four times as many thermal units of energy as the identical SIP home during winter. Air leakage was 68% greater in the conventional home, and temperature fluctuations within the stud wall were higher and more volatile than the foam one.